The gorgeous pastry case at Sixth Course. Photo from Facebook. ~SIXTH COURSE~, a truffle and dessert shop from owners Bridget Labus and Gianina Serrano that has been in the works since 2011, is now open in the Mission. The ladies are famous for their truffles, including a boozy line with offerings like one infused with St. George single-malt whiskey, though the shop has branched out and you can also find items like modern cakes and pastries. Yelpers mention a lemon thyme tart (yes please) and fruit verrines. Plus, they’ve got late-night hours for dessert after dinner. Sweet! Hours are Wed-Thu 2pm-10pm, Fri-Sat 3pm-11pm, Sun 12pm-6pm. 1544 15th St. at Capp, no phone. 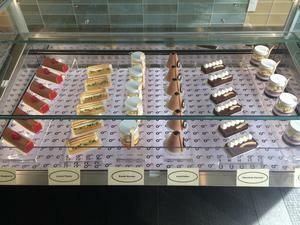 As previously reported on tablehopper, popular macaron maker ~CHANTAL GUILLON~ has moved to a larger kitchen location in SoMa and has officially added a storefront and opened for business. The new location joins one in Hayes Valley and another in Palo Alto, and offers a changing roster of seasonal and classic flavors. Hours are daily 11am-7pm. 1309 Howard St. at 9th St., 415-864-2400. The Marina has a new spot for Mexican vittles: ~BONITA TAQUERIA Y ROTISSERIE~. The menu includes tacos, fajitas, and burritos with various protein choices like carnitas, rotisserie chicken, and vegetarian. Initial Yelp reviews are generally positive, with mentions of fresh flavors and quality ingredients. 2257 Chestnut St. at Scott, 415-801-5599.